Is The Air In Your Home Safe? Has Fiberglass Insulation Replaced Asbestos as the New Health Hazard? Professor Alan Hedge, Cornell University. Indoor air quality in schools. Fiberglass found in the air. Fiberglass: Use It With Caution! 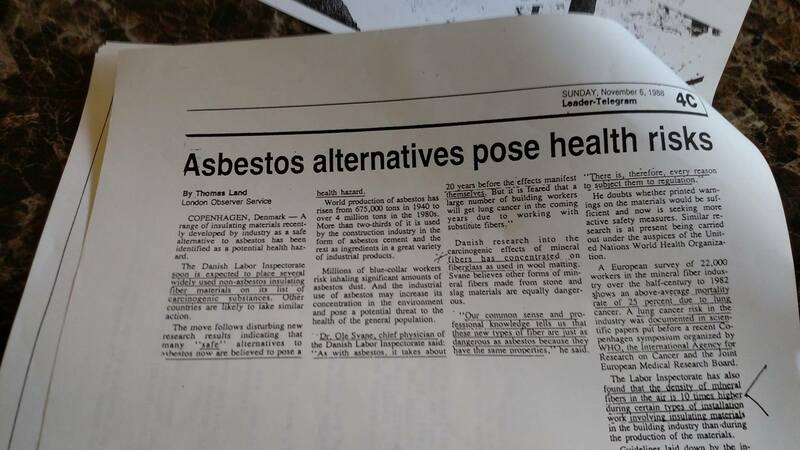 Is the Fiberglass Health Threat the New Asbestos? Is the Fiberglass in Your Attic or Walls Causing Cancer? Is it dangerous to inhale airborne fiberglass fibers? HVAC Systems: Is Yours Contaminating Your Home? Is Your Insulation Hazardous to Your Health? How safe is your basement? 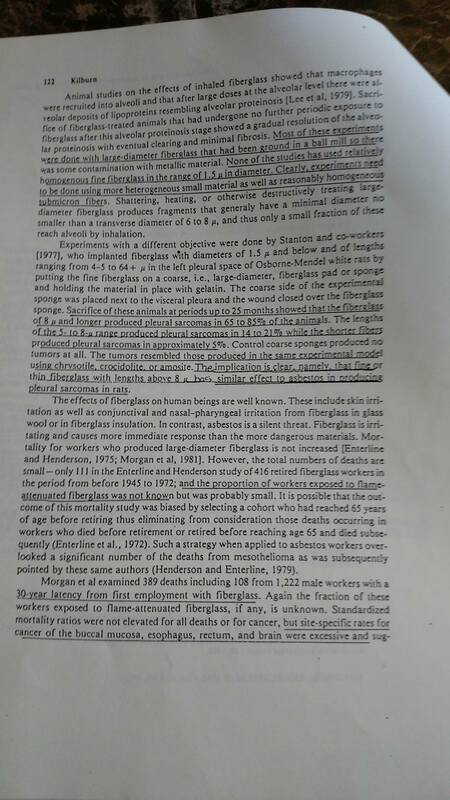 Cancer mortality among styrene and fibreglass exposed workers in the reinforced plastic boatbuilding industry. Fiberglass Insulation: Extremely Hazardous To Your Health! Indoor Air Quality Problems: Dust Troubles Part 2. I am having issues with airborne fiberglass. I have read a lot of articles online that link to your website, however I can not seem to find any information on the dangers of fiberglass on your web site. Were they all removed? 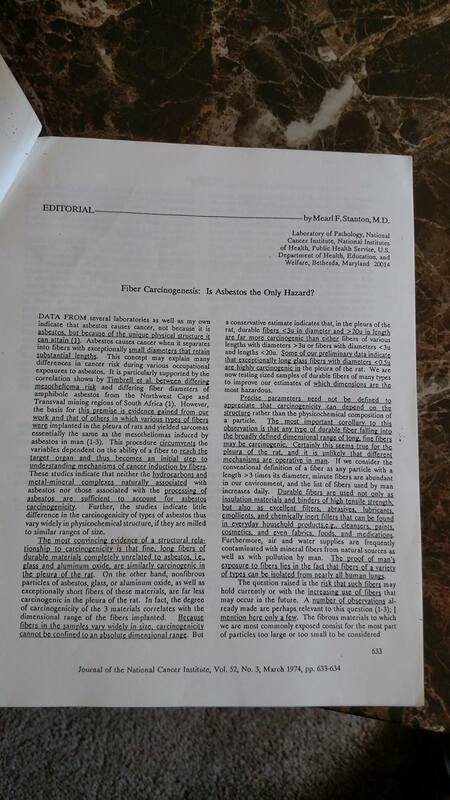 For example, the following link no longer mentions fiberglass. 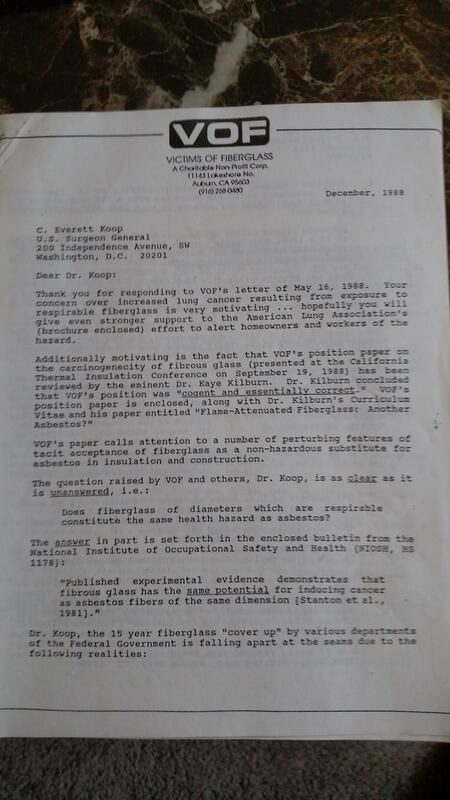 Do you still consider exposed fiberglass a health risk? My house was full of fiberglass and I am slowly removing it. Anytime I am near new or old fiberglass my lungs feel tight and I have difficulty breathing until I shower and change my clothes. My daughter has the same problems. On windy days I can feel it blowing outside my attic vents that are over top our deck. There are many public places that I can no longer enter without feeling the effects of poorly installed fiberglass. My place of work had fiberglass on the inside of the air conditioning ducts, every time the AC came on I had to leave the building, they have since removed it. Even the fiberglass industry mentions some of the dangers of handling fiberglass, so I'm wondering why you no longer mention it as a possible indoor air pollutant. How = Many other websites linking to yours. 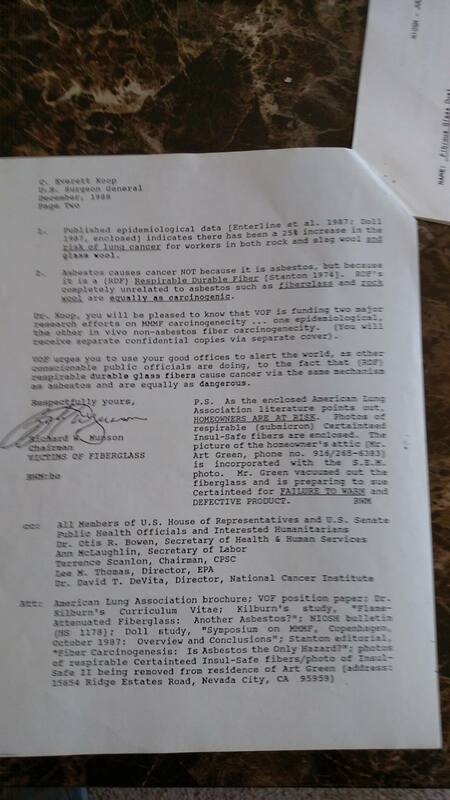 Thank you for contacting the American Lung Association. Fiberglass and associated dust/fibers are currently only regulated as a nuisance dust, which is why a great deal of information about fiberglass has changed. The Occupational Safety and Health Administration (OSHA) has downgraded fiberglass from human carcinogen to nuisance dust, see here: https://www.osha.gov/SLTC/syntheticmineralfibers/table.html. Studies are continuing on the long-term health effects of the many forms fiberglass and residues can take. 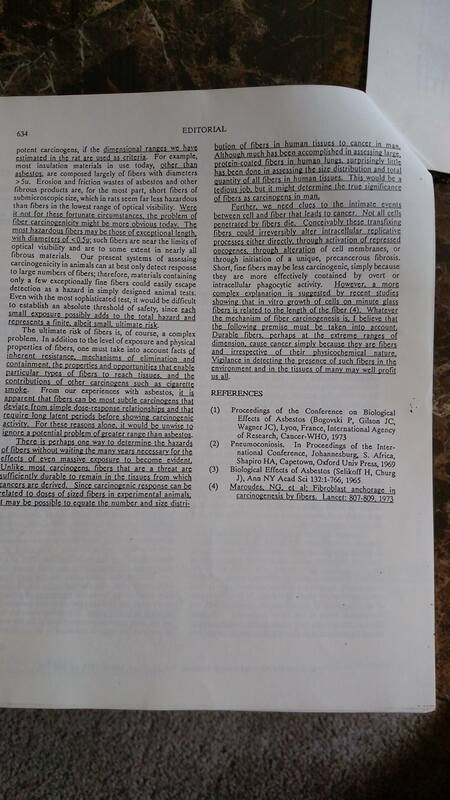 Most information that is current about fiberglass reactions pertain to skin irritations, irritation of the eyes, nose, and throat, and aggravation of asthma. I have worked in home construction and have done my own home remodels. When I am around insulation of ANY type I wear an N95 respirator and long sleeves, and immediately shower when I’m done. I am a severe asthmatic and do reactive to the fibers on my skin. As studies continue the information may change. I agree with what you are saying. I agree wearing a respirator is important when working with fiberglass. 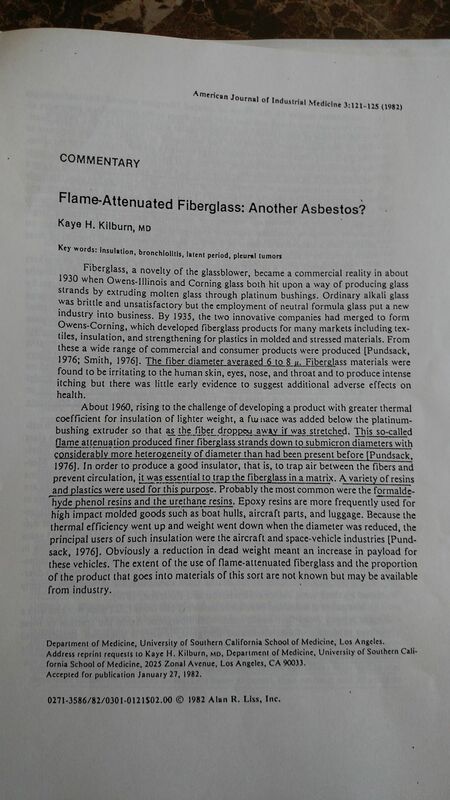 The problem is many people do not know this, so why don’t you mention fiberglass on your page of indoor air pollutants? I see that you mention carpets, everything that applies to carpets would also apply to fully exposed fiberglass. I am not talking about fiberglass that is sitting behind a wall, I am talking about people who have it hanging from their basement ceiling where their kids play, or shoved into every little crack of their workshop or garage. Like carpets, exposed fiberglass may also trap pollutants like dust mites, pet dander, cockroach allergens, particle pollution, lead, mold spores, pesticides, dirt and dust. Just because fiberglass may not be proven to cause cancer does not mean it is not an irritant that can bother the lungs. That is why the fiberglass industry recommends wearing a respirator when working with or around fiberglass. No one recommends having fully exposed fiberglass in a living space, yet this is what many people do when they turn their basement in to a kids playroom. So all I ask is maybe you consider adding fiberglass back to your page of indoor air pollutants, even if you just say what you told me in your email. Let people know exposed fiberglass impacts your health just like carpets can.